Following his recent Mad Max retrospective, Andrew Brooker returns to take a look at George Miller’s latest entry to the series. Spoiler: he bloody loves it. It’s been 36 years since George Miller changed the face of action movies and defined the post-apocalyptic genre for decades to come with his original vision of the future, Mad Max. It’s been 34 years since he made one of the most iconic action films to ever grace the cinema, paving the way for a sea of imitators that lasted more than three decades and it’s been 30 years since the slight misfire that was Beyond Thunderdome. With the kind of pedigree the Mad Max franchise has, you could be forgiven for being a little skeptical at a reimagining of the title a few decades after the last one has been and gone. Mad Max: Fury Road has had a turbulent time getting to us. Green lit 15 years ago once a script was completed and returning helmer George Miller was ready to shoot. Cast changes, a complete location shift from the Australian outback to the African desert and a huge delay to reshoot large portions of the film had us wondering if we would ever see the film. Coming dangerously close to becoming the stuff of myth and legend, Fury Road seemed destined to find a permanent home in development hell, never to see the light of day. Thankfully, today the world can see the film that nearly wasn’t. The film that looked like it had been canned more than once over the years and frankly, the film that everyone needs to see. Now bear with me, because I’m going to start with a negative. 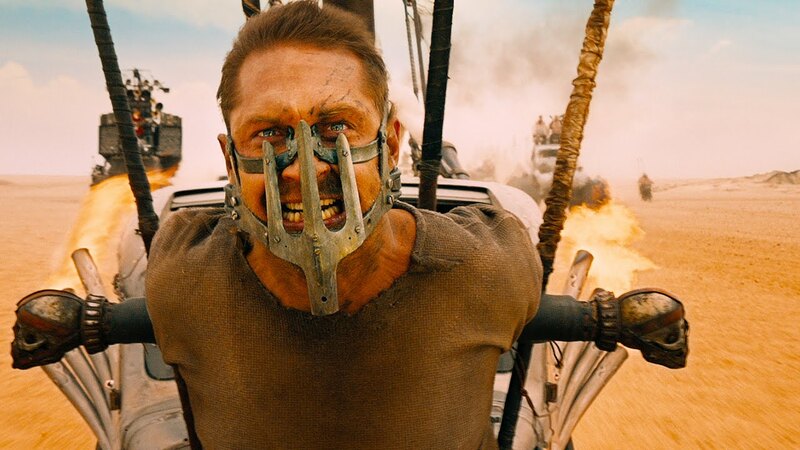 My one and only problem with Mad Max: Fury Road is that I simply don’t know what I can and can’t talk about. I usually base those decisions solely on what’s been shown in a film’s trailer but even the ads are a bit spoiler-ish and as such I avoided them all. Every scene should be experienced unspoiled and fresh on that big screen without having ever seen it before. On top of that, it’s a Mad Max film. These films have very little story to them and are instead all about the visuals and the feelings those visuals emote in its audience. With that in mind, and I hope I’m allowed to do this, If you want to see the film unspoiled as I suggest, skip straight down to the last paragraph for my wrap-up and come back when you’ve seen the film. I promise there will be no spoilers, I will keep to what has been shown in the marketing for the most part, with an occasional bit added for context and elaboration, but I’ll be talking about a few details I was very appreciative of not knowing much about on my first viewing. Mad Max: Fury Road is essentially a reboot of the series that forgoes the world building of the first film. So instead of being a complete restart to the story, we first meet Max an unspecified amount of time after he’s lost his family to the brutal gangs that run amok across the post-nuclear wasteland of Australia. Having already spent years foraging for food and gas, The ever brilliant Tom Hardy takes on the title character, replacing Mel Gibson and making the role his own. Hardy’s Max comes to us a broken shell, near feral, being chased across the sand by the ferocious War Boys, a savage tribe of warriors led by the terrifying Immortan Joe (brilliantly played by Hugh Keays-Byrne – the original Mad Max’s “Toecutter”). Within a minute of the opening shot, former cop Max Rockatansy’s iconic Pursuit Special is destroyed and Max is taken prisoner, branded and stuck in a cage in Joe’s Citadel, a fortress built into the rocks of the outback, and left to rot. While this is happening, Joe’s best rig driver, Imperator Furiosa, played wonderfully by the amazing Charlize Theron, has taken a detour on a routine transport run prompting suspicions from the War Boys and their leader. It quickly transpires that Furiosa has helped Immortan Joe’s wives escape their captivity, running from their lives of forced breeding for the self-appointed king and desperately searching for a safe place to continue their lives free of servitude. The War Boys give chase, and so begins the greatest 110 minute chase scene in the history of film. For reasons best left alone for fear of ruining way too much, Max finds himself joining Imperator Furiosa on her war rig, fighting against King Joe and his tribe battling to get his prized harem back from the traitor that took them from him. Cutting a path through the wasteland in their heavily armoured tanker truck, Max and Furiosa find themselves in a frantic, constantly moving vehicular skirmish as the tribe calls for backup from the outlying gangs and tribes that hunt in the desert. As the numbers against them increase, the odds seem to get ever more hopeless for the road warriors who are in just as much danger from the road ahead of them as they are from the crazed animals in cars behind them. As was the way all those years ago, Mad Max: Fury Road‘s genius isn’t so much in its story as it is in its design. Not one detail is missed and not one thing you’ll see is an accident. The cars have been meticulously built to be functional but look menacing. From one tribes bug looking vehicles that have been covered in spikes to the huge truck that has only one purpose; to house every speaker known to man, four guys on drums and one guy playing an insane guitar that spits fire from its neck at random intervals. I kid you not, no matter how I describe it, you won’t believe it when you see it and you won’t be able to keep from laughing at it when it appears. It’s spectacularly stupid and hilariously brilliant. If any other film done that, you’d up and walk out of the theatre shaking your head in disgust, but George Miller has weaved a world so good, so colourful and so absolutely bonkers that a dude playing fiery guitar on a sand truck not only makes absolute sense, but it fits right in! The vehicular carnage in Fury Road will be a yard stick for years to come. All action scenes will be compared to these for the next few years as the film turns everything up to eleven as it crushes, rips apart and blows up enough cars and trucks to fill a decent sized service station. The first big chase alone, the chase that introduces Furiosa and Max was a 20 minute spectacle that when it ended, when the screen was filled with light and silence, I discovered I’d been holding my breath and was literally on the edge of my seat. I was relieved it was over so I could relax, have a swig of my drink and take a couple of breaths. Almost as soon as I had relaxed and my heart had returned to its normal rate, Mad Max: Fury Road pushes yet another adrenaline fuelled skirmish onto the screen and makes you sit in awe as Miller find more spectacularly twisted ways of destroying cars, trucks and people as Max, Furiosa and the Wives try to get to their destination in one piece. Now don’t be fooled. This isn’t The Road Warrior and Max isn’t protecting a fragile group of people that don’t know how to defend themselves. Here, Max is simply along for the ride and has found himself in the middle of an escape plan hatched and executed by Imperator Furiosa and the women she is helping escape. Almost surplus to requirements, Max has met a group that can be just as ferocious as he is and are just as determined to survive the harsh landscape on their own. Charlize Theron does an amazing job of bringing Furiosa to the screen and in the illustrious tradition of Ellen Ripley and Sarah Connor before her, the deadly war rig driver stands proud as one of the greatest, strongest female characters ever to grace our screens. Holding her own against the biggest and baddest of Immortan Joe’s army, Furiosa and the wives are more than capable of standing up for themselves and keeping themselves alive when the odds are seemingly against them. Last generation, almost every action film was influenced, some more than others, by George Miller’s original Mad Max films. The director had created the epitome of on-screen action and everybody needed to take their cues from him to be taken seriously. Now, a new generation of films and filmmakers are coming. And every single one of them will be turning to Fury Road for guidance and inspiration. Redefining a genre Miller himself created almost four decades ago, Mad Max: Fury Road is nothing short of a masterpiece. Amazingly filmed, beautifully visceral combat; stunning visuals and an amazing score all added to the near flawless acting and the direction that makes you want to get up and cheer throughout the film; they all combine to make one of the best cinematic experiences I’ve had in quite some time. I can’t recommend this film enough. It is, in a word, perfect.